The core of a compact heat exchanger is a set of heat-transfer plates. The plates form channels where the hot and cold media flow on alternate sides. Most models have flat plates but in a spiral heat exchanger they have been curled up to form a spiral.The highly turbulent flow gives compact heat exchangers high heat transfer efficiency. The overall heat transfer coefficient is up to five times greater for a compact heat exchanger than a shell-and-tube. This means a compact heat exchanger is much smaller than a comparable shell-and-tube. The overall flow of the two media is counter-current in a compact heat exchanger, i.e. the hot medium exits where the cold medium enters. This means the cold medium can be heated to a temperature very close to that of the entering hot medium. The temperature difference, ΔT, can be as low as 2°C (3.6°F). The counter-current flow allows a compact heat exchanger to operate with crossing temperatures, meaning the cold medium can have a higher exit temperature than the exiting hot medium. The close temperature approach means the heat exchanger requires less of the utility medium or you can use one with a temperature closer to that of the process medium. Both cases result in lower operating costs. The combination of a close temperature approach and crossing temperatures makes it possible to recover maximum amounts of heat from the process and put it to use in other parts of the plant. The plates form channels where the hot and cold media flow on alternate sides. 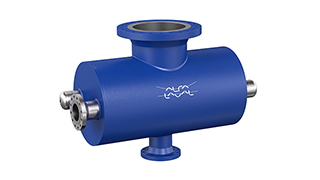 Alfa Laval offers a wide range of solutions for all types of heat transfer duties in petrochemical plants.